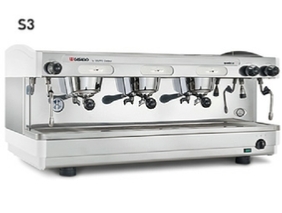 Coffee, espresso, automatic and filter coffee machines. Ideal for a 200 seater restaurant. The S2 has two steam wands, two porta-filters, thermo-compensated group heads, and comes with a scale inhibitor installation kit. We have sold many S2’s to very satisfied customers. 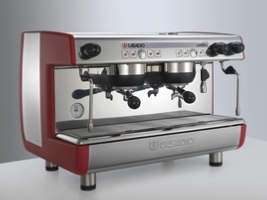 This is a very affordable machine for the smaller or start-up operation and comes highly recommended by the Freshly Roasted team. This is semi-automatic is designed to work hard in a 60-200 seater establishment. 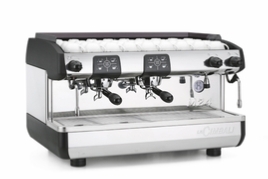 In addition to it’s good looks the S24 has two steam wands and sufficient steam and pressure to keep two barista's working at the same time. It comes with three porta-filters and has temperature controlled group heads, a volumetric pump and comes with a professional installation kit. La Avenia drip filter 2 x 1.8 Ltr. Ideally used in conference centres, breakfast rooms and coffee shops. The Avenia comes with two hot plates; 2 x 1.8 ltr. Jugs. Whether this is used for your filter coffee of the day or a mealtime rush, these machines are an essential piece of your catering equipment. Keeps your coffee fresher for just a little longer, 2,2 Lt. vacuum pump flask with a stainless steel brew basket similar to the drip filter above. Ideally used in conference centres, breakfast rooms and coffee shops. On demand grinding at it’s best. 1.2 kg hopper and a capacity of 6.5 kg per hour. LED display; single and double dose with programmable doses and micro-metic setting counter. 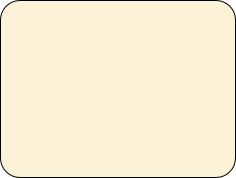 Important notice - the prices contained on this website for coffee machinery and equipment is illustrative only. All equipment is imported and subject to the vagaries of the volatile South African ZAR. Please contact us for a formal quotation. 1. East London and surrounds - No shipping costs. 2. Post Office: Suitable for SA smaller towns, or anywhere in SA. R 30 for item 1 and R 10 for each additional item thereafter to a maximum of R 50 irrespective of quantity. 3. Door-2-door for all major cities. A maximum fee of R 80, irrespective of quantity. Frequently asked questions; Support SA business; Coffee origins; Artisinal coffee; Coffee roasting video; Blend or single origin; Roast types; Coffee drinks; Coffee tasting; Jura automatic coffee machines; Filter machines; Espresso machines; Stove top machines; Coffee machine rent or hire options; Buy coffee online; About our online club; Coffee grinders; Barista guidelines; Extracting flavour; Acidity or bitterness; Contact us. If you don’t see what you are looking for on this page, please contact us. We have over 300 items on our books and will assist you in selecting what is best suited for your application. If a model is designated A - this is an automatic, programmable version. This enables one to pre-set the time that water will pump through the porta-filter which can assist a barista, particular those less skilled. If designated S - this is a semi-automatic model and is not programmable. The 2 is for two-group models and the 3 is for 3 group, an A3 (pictured left alongside) is therefore an automatic three group machine. CasadioA2 R44460 . CasadioS3 R60078 . CasadioA3 R65732 .